So Anthropolgie has these amazing stockings that I recently saw on Skunkboy Creatures's blog. 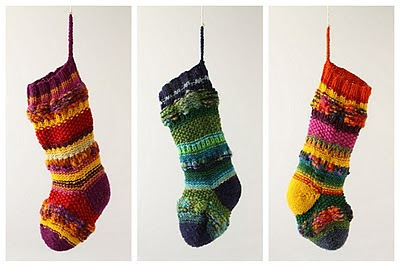 I've only ever crocheted 3 stockings in my life. My ex-boyfriend & I traded gifts in them one xmas & then I made (a pitiful) one for my dog. This has given me inspiration to make another one for my little pup. I hope I get it done in time for xmas! I've also seen stockings made from a wool thrift store sweater. Here's the idea from Crafting A Green World. Use a crazy "Cosby" sweater or recycle that Ugly Sweater Party pullover you bought into a cool little stocking. I am so tempted to buy these, but I know I can DIY! What Christmas decor have you been tempted to buy but have DIY-ed instead? OH MY GOSH. I love these!!! I want to make them! These are FABULOUS! I want one in sage green and charcoal gray.